have issues with organization. Creativity resides in the right side of the brain. Right brains (RB) tend to think cleaning up and organizing is boring. The concept of time, structure, and detail traits reside in the left side of the brain. RB folks are very good at starting & creating projects, but because the RB needs constant stimulation, their interest wanes and the original inspiration is lost. Most projects require the left brain (LB) trait to stay within time limits. 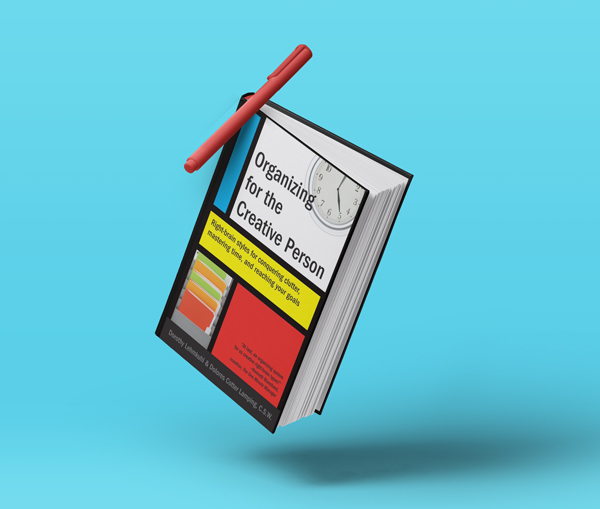 This book offers ideas for right-brainers for conquering clutter, mastering time, and reaching your goals. Here Are A Few Tips For Right-Brainers! Concentrate on the task at hand and at YOUR best time. Time how long routine tasks take, so you don’t over or underestimate, to lessen procrastination. Delegate tedious tasks that bore you. Keep a “not to do” list that is comprised of things you may do that keep you from being productive. Find appropriate storage for unfinished projects, make a note where you stored it next to the date on your calendar that you scheduled time to finish it. Get rid of unfinished projects you don’t like, want, or need. Create “departments” where you keep things stored together that you use at the same time. Replace “should” with “want to." be comfortable letting some of life go by while you concentrate on what is most important to you. This was a great read with tips you can put into place RIGHT away!